Stackpole is a pretty little village in South Pembrokeshire. It has an award winning gastro pub – the Stackpole Inn which is a traditional stone built Inn with low beams, log burner, excellent food and a beautiful beer garden to the front. For meals booking is recommended. The village is a sought after place to stay because it is the closest village to Barafundle Bay. It adjoins National Trust woodland and it is approximately a half hour walk to Barafundle Bay – a very special place which is often listed as one of the top 10 beaches in the world. There are also walks from to Bosherston Lily Ponds (aka Bosherston Lakes) and Broadhaven – another of Pembrokeshire’s finest beaches. 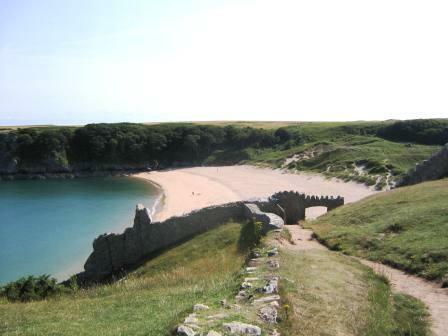 There is a beautiful stretch of limestone coastline, with stunning views, between Barafundle Bay and Broadhaven Beach. Bosherston Lakes were created in the 18th and 19th Centuries as part of a designed landscape scheme for Stackpole Court Mansion (sadly demolished in 1963) and are now nature reserves owned by the National Trust. The village was moved to its present location in the 18th Cenury to make way for the mansion. Other places of interest on the Estate are the Walled Gardens and Stackpole Quay, both of which have tea rooms. There is an interpretation centre for the Stackpole Estate in the old Dairy. As you walk around you may see otters, bats, dragonflies and wildfowl, also man made garden features from the 18th Century such as grottos and an ice house. Fishing is by permit only. No boating on the lakes but the sea here is excellent for kayaking. The Village is in South Pembrokeshire in the south west tip of Wales. It is 3 miles along the coast from Freshwater East, 5 miles south of Pembroke and 12 miles west of Tenby. It is also in the Pembrokeshire Coast National Park. It is approached by single track country lanes.